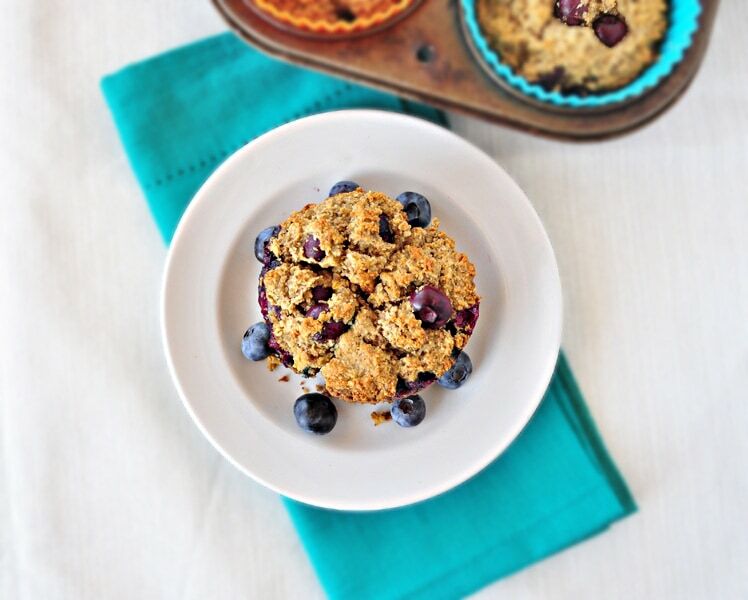 Gluten Free Blueberry Muffins. I just love blueberries. Spring is one season I look forward to, not only for the weather, but for the berries! I have been wanting to make healthy blueberry muffins ever since I came up with my spelt blueberry bread. Well today was the day and these gluten free and vegan blueberry muffins came out great. 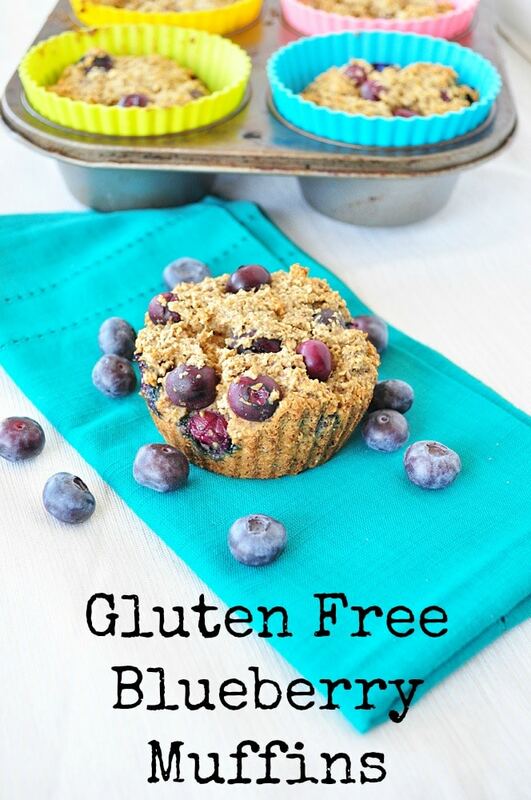 These gluten free blueberry muffins almost remind me of a muffin version of my blueberry baked oatmeal. I think the thing that makes these gluten free and vegan blueberry muffins so special is the hint of lemon. It really helps freshen these muffins up. They are also super moist and would make a perfect breakfast for the weekend. You can also double the batch and freeze some for quick breakfasts on the go. Super moist muffins bursting with blueberries. Spoon batter into lined muffin tins . Bake for about 10-12 minutes or until a toothpick comes out clean. Wait until muffins are completely cooled before removing form pans. If making jumbo muffins, adjust the cook time to about 12-14 minutes. These muffins should be stored in the fridge. They should last about 2 weeks that way. You can also freeze them for longer storage. There are 2 eggs listed in the ingredients. I am vegan and used flax meal "eggs"
I didn't use spelt in this recipe. I used gluten free oat flour. OMG! These are delicious! I did not have pat flour so made my own with old fashioned oats in the food processor. I also didn't have coconut oil so I used natural grape seed oil and they turned out fantastic!! Never really made anything like this before and I'm so happy that it was simple and they taste great! Definitely will have to check out more of your recipes! Thanks Melissa!! This is one of my favorites. Any problem or adjustment needed using frozen blueberries? I don't think so. Just let them thaw before using. This is my first attempt at baking so I have some basic questions. I just made the muffins, is the batter supposed to be that dry? And how come they don't rise? Finally, I had to make some substitutions, like type of flour and butter instead of oil, would that effect the baking time for after 16 min they are still not baked. Help! These were delicious! I used grapeseed oil because I was feeling lazy and didn't want to melt the coconut oil. Also I had to bake it in a bread pan because I forgot I had loaned out my muffin tins :-) Even my picky 4 year old loved it. Oh yay! So glad you liked it Tess! my son has to stay on a gluten free diet,i have been learning & looking for yummy recipes that appeal to teens, can you recommend any good cookbooks? i found your recipe for the blueberry muffins, looks great, i wanted to bake them, i do not have applesauce on hand, what could i use as a substitute? What does 2T mean for the coconut oil? 2 tbs?